This year was no exception—in fact, possibly the worst October weather I’ve seen in my 16 years of farming. The explanation, rather embarrassingly for an ex-oceanographer, is simply equinoctial gales—October is the time when the storms of the Southern Ocean tune up with changes in sea surface temperatures, and the consequent combination of wind, rain and cold air temperatures over Tasmania are all too often fatal to newborn lambs. The view from the hilltop after 48 mm (2 inches) of rain overnight, 29 September. For the last three years, I haven’t lambed at all, due to the paucity of forage, and thank goodness I didn’t this year. Since the last two days of September, we’ve had 89 mm (3.5 in) of rain, 21 days with either rain, hail or frost (or all three! ), most with strong to gale-force winds. As I’m writing this, the wind is gusting 50 kph (30 mph), it’s raining, and tomorrow’s forecast is for snow down to my elevation. Up to my shins in Curly Sedge Creek after the same rain. 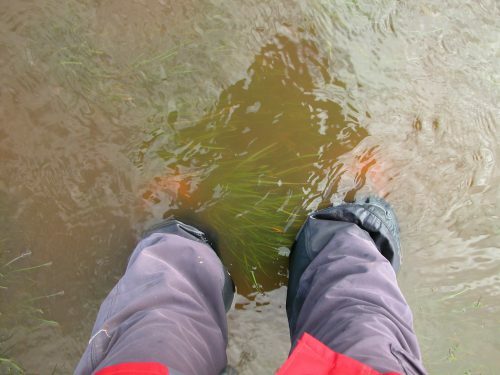 It got deeper farther in, but my boots weren’t high enough to risk it! So, I am never, ever going to lamb in October again. 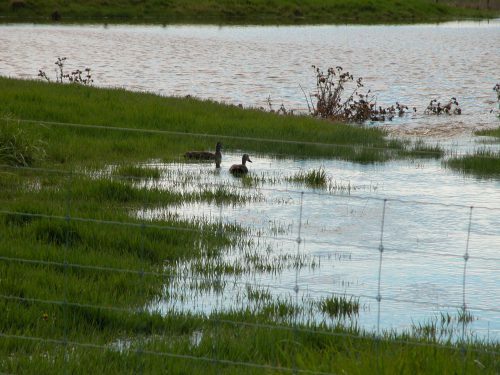 Wood ducks in the paddock surrounding the main waterhole (Willow Tree). The water just couldn’t spill out of the dam quickly enough to keep from backing up into the surrounds. To celebrate this commitment, I did something I’ve been contemplating for months: I put the rams out with a selection of ewes, in time for an autumn lambing. While not the usual thing in Tasmania, autumn lambing is not unheard of. March, in my experience, is the nicest weather month of all in Tas. To be fair, my feeling about this is biased by my very first visit here in 1995, when for two straight weeks in March the weather was absolutely delightful (well, except for one brief hailstorm). The flock in the yards, partway through separating the new “mothers to be” from the main flock. The reluctance to lamb in autumn comes, I’m pretty sure, from fear of not having good enough green feed for the ewes to make milk after a dry summer. I have a couple of tricks up my sleeve to offset that particular worry: my 50 acres of lucerne (alfalfa) are green year round, and a low stocking rate ensures I can reserve the best feed for lambing time. This year’s rains will give me the best opportunity in a long time to try the experiment, so I’m now committed: the rams were “joined” with the ewes the 20th of October, and will be out with them for 4 weeks. The ewes will start lambing at the ides of March—an auspicious time, I hope! The mothers-to-be a few hours later, out in Old Cabin, where I plan to leave them for the 4 weeks of “joining”, with forays into the lucerne and Waterfall Gully Reserve for diversity. I’ve only joined 98 ewes, all of them maidens, ranging in age from 3 to 5 years. (I won't ask any of my older ewes to have lambs--it will be enough for them to grow beautiful wool.) The rams are "maidens", too: all three of them are 4-year-olds. I will be cautious in rebuilding the flock numbers after the big sell-off last January. Twice in the last 10 years I’ve had to reduce flock numbers to 500 or less in order to cope with insufficient forage, despite only running 1000 or so (1 to the acre) in the years running up to this one. So, I’m not convinced 1000 is sustainable in the long term, especially given my high bar for what constitutes good nutrition and my desire to keep my aging sheep for their natural lifetimes. My best guess at this point is 750 to 800 is the number I should be aiming for to allow me to manage the vicissitudes of weather gracefully and sustainably. Ah, but what about the separation anxiety? Well, while the rams are out with the selected ewes the flock is split in two, for the first time since I began shepherding. While I don’t know for sure, I strongly suspect the new lead ewe is with the “mothers-to-be” flock, while the “main” flock now has a higher percentage of boys, all of whom have been given a small dose of testosterone to help them resist a condition resulting from excess protein (clover and lucerne) in their diet: bacterial infection of the sheath. Testosterone is quite effective, but also tends to make the boys a bit stroppy, as you might expect. Leadership in the main flock at the moment seems to be a bit hit-and-miss. Ahem. Maybe more hitting than missing. Leo, in front of Prince, with Horatio and and un-named wether looking on, in a paddock with lots and lots of clover. I honestly don’t know if the sheep are feeling separation anxiety—it’s entirely possible I’m the only one who’s anxious. But the subtle changes in leadership and flock dynamics are certainly there. And I’m also now trying to manage shepherding for both groups, which is certainly keeping me hopping! Clara (left) and Difficult Girl (right) following me with alacrity as I take them to Waterfall Gully for some diversity. They were moving so fast I had to keep running out front to get this shot. It is HIGHLY unusual to see Difficult Girl at the front–she is normally to be found at the back, arguing successfully with the dogs about who is boss! A new WGW website is in the works, and the next Yarn will introduce it. The site should be live by late November. The swans are growing like weeds, and a large family of mountain ducks (14 babies) are keeping them company on Swan Lake. The new She-oak Heather yarn (a literally dyed-in-the-wool colour blend) is due here in late November. The swan family with the mountain duck family in the background. The mid-sized ducklings are a group of diving duck babies without any parents around.